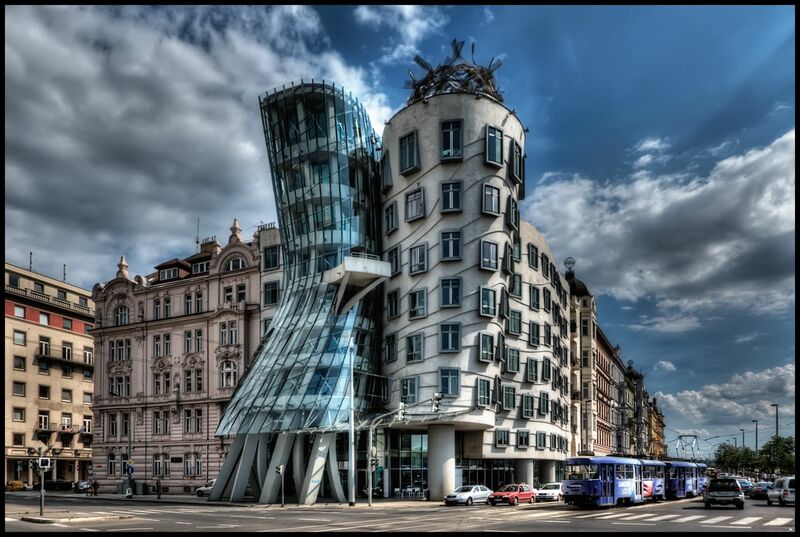 The Dancing House, designed by Frank Gehry, stands out in the Prague city centre thanks to its deconstructivist style. The Nationale-Nederlanden building was designed by the Croatian-Czech architect Vlado Milunić in co-operation with the renowned Canadian-American architect Frank Gehry. Built on a vacant riverfront plot, the magnificent, original building was completed in 1996. The building is commonly referred to by its nickname, Tančící dům (Dancing House), for its resemblance to a pair of dancers. Gehry originally nicknamed the building 'Fred and Ginger' after a pair of famous American dancers, but abandoned the nickname out of concern about Americanising Prague. Due to the non-traditional design, the building was controversial around the time of construction for blending questionably with the Baroque, Gothic and Art Nouveau buildings for which Prague is famous for. However, the then Czech president, Václav Havel, who lived next to the buildings for decades, heartedly supported the project, hoping that the building would become a centre of cultural activity. The shape of the building is now featured on a gold 2,000 Czech koruna coin issued by the Czech National Bank. The coin completes a series called “Ten Centuries of Architecture”. The Dancing House is mainly used as offices, but visitors can go to the Dancing House Gallery, as well as rooftop bar and cafe to enjoy a drink with a view of the river.